Bellsite’s 38th Annual Snowmobile Poker Derbywa held Sunday, February 26, 2017. 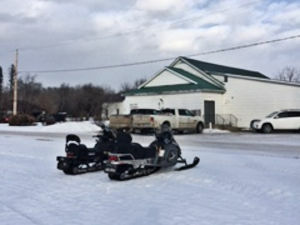 Due to the lack of snow and poor North Mountain Riders (sno man) trail conditions the Snowmobile ride of the Derby was cancelled. The Poker part of the Derby continued on as usual. 46 registered driver hands were sold and 71 people enjoyed the early afternoon meal, visiting, enjoying friendly conversations while waiting for the announcements of the door prize winners, the penny auction winners, the 50/50 draw, and finally the Derby winners, we gave out 50% to prizes that equalled $1,887.50. A big thank you to everyone that attended our Derby, the 60 people and/or businesses that donated money, time, or door prizes and of course all the people who donated food and/or time to make our day a success.